The Water Environment Federation (WEF; Alexandria, Va.) partnered with the American Water Works Association (Denver) to develop public outreach materials that communicate the value of water and wastewater services. WEF photo. A new suite of public outreach materials helps communicate the value of water and wastewater services and the need for infrastructure investment. The Water Environment Federation (WEF; Alexandria, Va.) partnered with the American Water Works Association (AWWA; Denver) to develop these materials, which are available to free-of-charge. 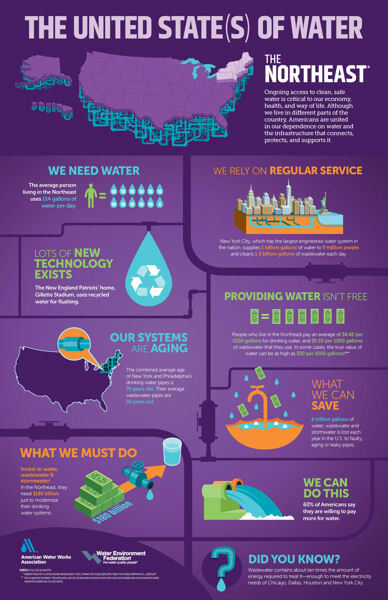 Infographics show regional details associated with water services and infrastructure value. WEF photo. 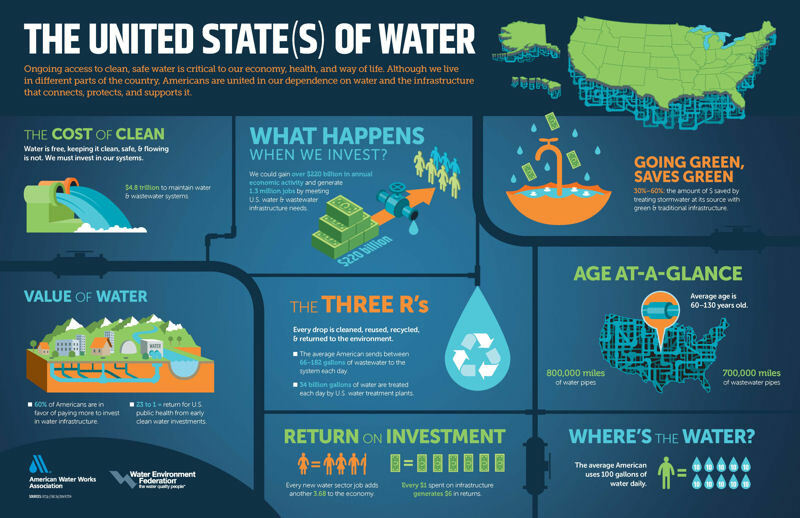 The materials include a series of five “The United State(s) of Water” infographics describing the use and value of water as well as the need for and benefits of water infrastructure in different regions of the U.S. The U.S. infographics will all be made available in Spanish as well as English. Another infographic provides this information for Canada both in English and French. WEF and AWWA also will provide a communications plan, messaging platform, radio public service announcement, bill stuffers, and children’s activities to accompany these materials. All these materials were developed to supplement other resources provided by the Value of Water Campaign, of which WEF and AWWA both are founding members. For more information, contact WEF staff member, Lori Harrison, at lharrison@wef.org.